Almost every blogger has one. An icon selected to represent… to symbolize… his or her voice. I’m often amused, impressed, or puzzled by the gravitar selections folks make. Do you feel this way, too? 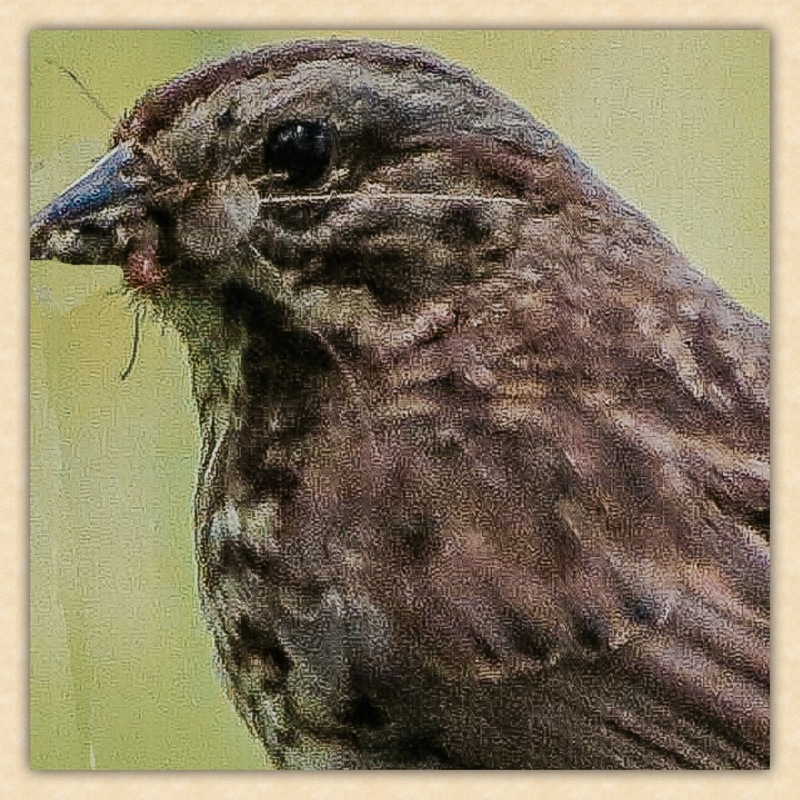 My blog symbol is pretty straight forward… a Song Sparrow. But, there is a not-so-apparent reason why I revere this little bird, and selected her to represent my voice. Eradicating invasive Himalayan Blackberries was a foundational step in building Beaver Willows Nature Habitat park on a piece of property that adjoins a wetland in our front “yard.” If you’ve ever tried weeding invasive blackberries, you can appreciate how blood-thirsty those thorny-monster vines can be. The only pleasant part of the work was a serenade provided by a Song Sparrow. Her sweet melody soothed the task of playing tug-of-war with the insanely long, barbed vines. She seemed delighted to follow my movements throughout the afternoon; singing gleefully, happy to have me as an audience. Anxious to get the job done, I was not careful with attention to the plants that grew in close proximity to the target of my plant-slaying quest. Then it happened… a small, empty bird nest woven neatly from wetland grasses dangled in a mass of vegetation; it was caught by the spiky spines that protruded from the vines. At first I was thrilled by the find. It felt like I had received a trophy in reward for my good deed of removing noxious weeds from our wetland property. Oddly, the little song sparrow ceased to sing. It took only that moment for me to realize the snagged nest was hers. My heart sank as I commenced to serenade her with sincere apologies for what I had carelessly done. Next morning, the work of blackberry eradication continued, but with less zeal in the aggressive approach I had employed the previous day. After studying the plant community, I decided to leave some of the blackberry thicket along the margins where hardwood trees and softwood shrubbery meet with the wetland. As if giving approval and a sign of forgiveness, the Song Sparrow continued, as she had done the day before, with her beautiful chorus. Weeks later, came the realization why I so profoundly admire the Song Sparrow. Her song lured me to a place in the thicket where purposeful flight was rustling in and out of the remaining blackberry vines. Then it happened! The tiny chirps of hungry hatchlings formed a new melody. The Song Sparrow did not give up that day her nest was reeled out of the brambles… she skillfully built a new one. As the days of spring passed, I sat on a nearby stump and observed as she and her mate cared for their youngsters. I still have the remains of the first nest. It’s been picked through by other animals and disturbed by winds, rain, and snow. But is still serves as a reminder of my appreciation for the Song Sparrow’s forgiving spirit, her cheerfulness , and the tenacity she exhibited in rebuilding what was lost in order to move forward with life. It also reminds me that nature’s ecosystems are intricate networks that support the organisms living in a particular habitat. One small change can have life-changing consequences. In the case of the the disturbed nesting site, I was fortunate because the Song Sparrow was able to recover and prevail. But- this is not always the case. We, as human-beings, must evaluate how severely we choose to impact nature . . . there are times She will not be able to recover. My Song Sparrow gravitar provides an enduring reminder of the lessons learned from a little songbird. I suggest that all humans adopt a personal icon… a symbol from nature, to serve as a continual reminder of our connection, and dependence on Her for Life. My husband’s reaction when I asked him about his nature symbol was… contemplation. He replied that he can’t say off the top of his head what it is because this choice runs deeper than merely selecting a “favorite” animal or thing in Nature. I respect his reaction, and wonder… will you do the same? Think deeply about your Nature spirit-symbol and then follow it evermore to meaningfully connect with and honor your relationship with our Natural world. What an inspiration you are, Jane! ❤ you are so kind. Jane, Your tale covers many of the aspects we should all be paying heed to in our urbanising planet. I marvel at the resilience and adaptation so many wild creatures make in niche habitats. One of my top favourite apps is a local bird ID with recordings of calls, and the many variations of songs. 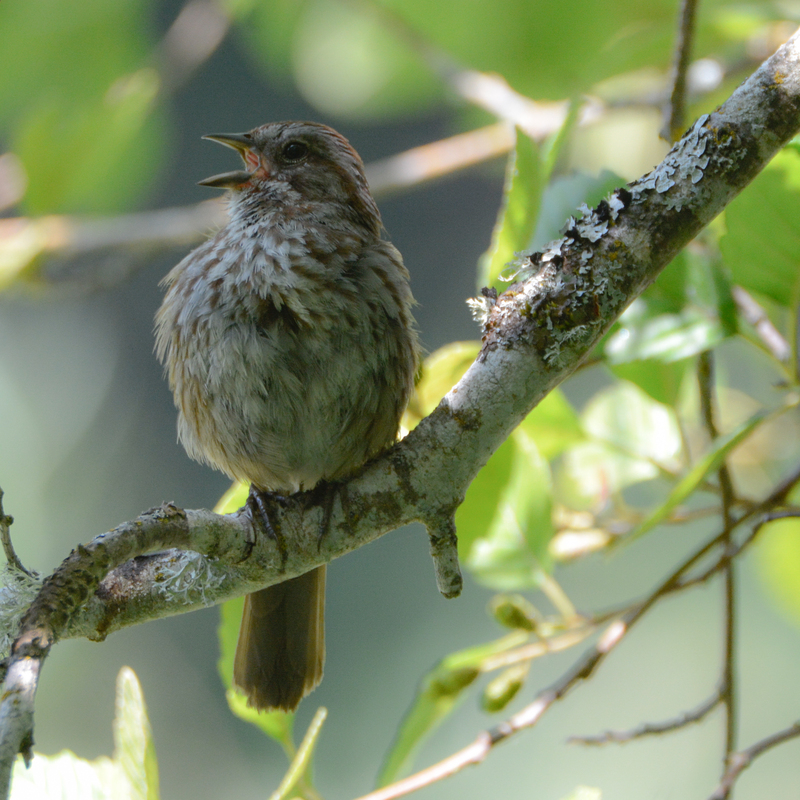 I was inspired to google the song sparrow and I landed up on the Macaulay library site listening to various calls…. the category for the most spine tingling was the common loon – how gorgeous a call is that! I then got onto a most informative site – BirdNote listening to juvenile Song Sparrows learning to sing. Loved the descriptive terminology and the young bird graduating to their full adult songlines. The site is wonderfully informative, and though US based, i’ve signed up for their newsletters. I really loved this post, Jane. I appreciated learning the story about your Gravatar, and reading about the Song Sparrow in your wetland area. What a touching story and post ❤ . If I could pick an animal Gravatar one, or a nature spirit symbol, I suppose it would be the turtle — most especially sea turtles. That was a profoundly impacting experience. I know you understand,Lola Jane, and can appreciate your choice of the sea turtle. Thank you for your kind thoughts. This is an incredible post. I never really thought about our icons as symbols before. You’ve given me a lot to think about, Jane. Lovely icon and a remarkable story behind it. Thanks for sharing your story with us. Debbie, you are a sweetheart. I’m happy you enjoyed the story. BTW- your icon is one that puzzled me for the longest time… and then one day… there they were, your sandals! How clever (and amusing). Now I think your icon is impressive and an appropriate symbol of the colorful stories you tell as you walk longer and longer in your life on the island and learn more and more about the culture, natural history, and day-to-day happenings in Nicaragua. No, I’m nothing like a Song Sparrow… am always being teased about my inability to carry a tune!!! I’m glad your story had a happy ending. I’ve thought off and on over the years about what my spirit symbol might be. Still searching. Maybe it’s a canid, like my icon. Perhaps you’ve already found your answer in the canid. There are MANY positive facets to our canine friends…as you’ve captured in your glasswork.I just peeked at your Glass Manifestations site. Oh, so beautiful, Maggie. I must go back and look some more!